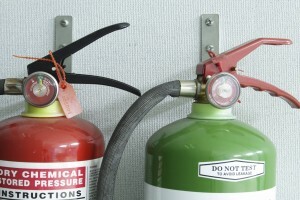 Fire Extinguishers: What are their Categories? When it comes to fire protection within a commercial setting, one of your best defenses is a fire extinguisher. Fire extinguishers can be used to help fight small fires that ignite, or at least provide a defense to allow building occupants to safely exit the building. However, not one fire extinguisher will work on all fires. Certain fuels need specific extinguishers in order to work. In order to ensure your occupants are safe from possible fire threats, you must first understand the categories of different fire extinguishers. Water- These types of fire extinguishers are used on Class A fires. These types of fires are burning from a solid fuel like paper, wood, and plastic. These fire extinguishers will extinguish the fire by absorbing the heat from the fire. The color code used for these types of extinguishers is red. Powder- These types of fire extinguishers are used on Class A, B, and C fires. They use a mono-ammonium phosphate that will melt once the fire reaches temperatures of combustion. Once melted, a sticky substance will rest on solid surfaces, cutting off the oxygen source of the fire. The color code for these extinguishers is blue. Foam- These fire extinguishers are used on Class A and B fires that are fueled by solids and liquids. The foam is used to suffocate the fire while also working as a cooling agent. The color code for these extinguishers is cream. CO- These extinguishers are used for Class B and Class E fires, when liquids and live electrical wires are engaged. The extinguishing unit used is not a conductor of electricity, making it safe to use on E fires. The CO is used to both cool and suffocate the fire. The color code for these extinguishers is black. This entry was posted on Friday, July 31st, 2015 at 5:45 pm. Both comments and pings are currently closed.